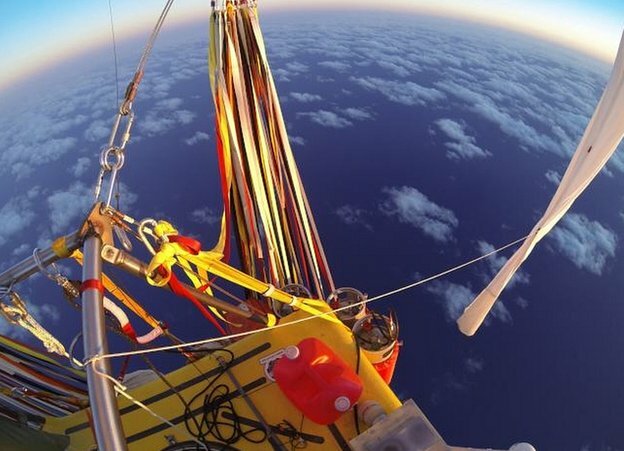 Two pilots in a helium balloon have completed their crossing of the Pacific with a sea-landing off Mexico, setting new milestones on a six-day trip. American Troy Bradley and Russian Leonid Tiukhtyaev landed safely, their Two Eagles Balloon team said. "The Two Eagles balloon team is pleased to report the Two Eagles balloon has landed safely just off the Baja coast near La Poza Grande," their team said in a statement. "The pilots made a controlled descent to a gentle water landing about four miles off the Baja coast. The balloon is stable and still inflated and the pilots are fine." The two pilots left Japan on Sunday and had aimed to land in Canada or the US. However, weather forced them to change course towards Mexico. They were met in the sea by a Mexican fishing boat. The statement stressed that the sea landing was acceptable "under the international rules governing the establishment of world records". "Two around-the-world attempts using a different type of balloon landed in the water and were approved as records." The two pilots needed to beat the existing records - both set in 1981 - by 1%. 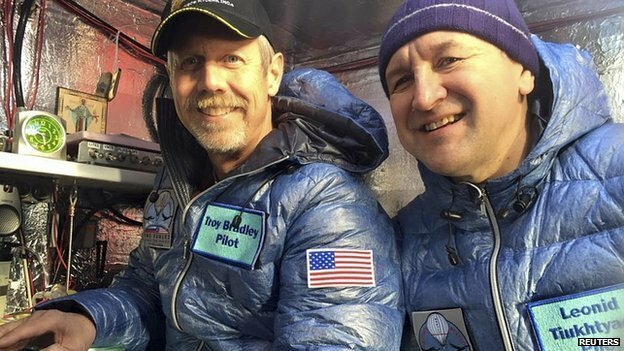 The Two Eagles Balloon team said the landing "occurred at six days, 16 hours and 37 minutes", with the pilots covering the distance of 6,646 miles. The hi-tech "Two Eagles" balloon is made of a strong Kevlar and carbon-fibre composite, but weighs only 220 pounds (100kg).